When pouring water is combined with victimizing her (willing) brother, a happy Pudding ensues. Pudding hums. I’m not sure that hum is the best way to describe the sound that she makes, but I can’t come up with anything more specific. I’ve read that many pre-verbal children hum, and that eventually those hums turn into songs, and then more typical language. But Pudding is very verbal, and also likes to sing. The humming has only appeared in the last few months. This sound, the hum-like noise, is monotonous. It does change pitch on occasion, but for the most part, it is a steady drone. It is almost like the “om” sound that gets chanted in yoga, but much more annoying. I’m sorry to say that I can’t stand it. It needles its way down to my last nerve. I don’t stop her. Though it drives me crazy, I don’t stop her. It is a stim, and a harmless one at that. Like with her hair-twirling, I feel that if it gives her peace, there is no reason to interfere. But honestly? I can’t take that noise. It is like living with a perpetually annoyed Marge Simpson. There are various theories as to why kids on the spectrum hum. It may be to block out extraneous noise, or to create noise when the world seems too quiet. Some kids do it when they’re happy, others when they are sad. I’ve tried to figure it out with Pudding, but I’m unable to do so. She hums when places are loud or quiet. She hums when she is happy or sad, and anything in between. The only connection I’ve really noticed is that it seemed to start during these last few months of sleep trouble. Though I don’t stop her, I can redirect her, and sometimes I do just that. I’ll put on music and encourage her to sing, or we’ll start playing a game. At some point, it occurred to me that she is oblivious, completely unaware that she is humming. I began humming along with her (which she likes) or asking her if she was humming. She still isn’t aware of it, until I point it out, then she stops for a while. In the meantime I remind myself that there are worse things she could be doing. I try not to mind too much when her little brother joins in. I tell myself that humming makes her happy, and that is enough for me. My response died on my lips. What if she really doesn’t like it? What if this is a compulsion she can’t fight? The thought made me want to cry, so I quickly changed the subject. Much as I don’t like the sound, I could tolerate it as long as I thought it was soothing or pleasurable for her. What if humming is just another thing that is out of her control, and making her unhappy? The next day I mentioned it to Spectrummy Daddy. Because she doesn’t seem to be upset when she hums, he was doubtful that it was the case. So we asked her again, and she still said no. Then we asked about other things that we know she likes and dislikes, and her answers remained consistent. She does not like to hum. So now I’m at a loss. I’m turning to you for advice. Do you hum? Did you hum? Your child? Should I keep pointing it out to her, or ignore it? Is redirecting her pointless, cruel, or necessary? 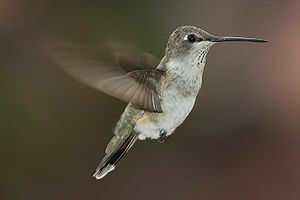 A final rhetorical question: I’ve never asked my hummingbird if flapping her wings makes her happy, so am I only interfering with this stim because the noise bothers me? When Pudding was first handed to me in the delivery room, her tiny hand reached out and grasped onto a lock of my hair, and didn’t let go. This was the beginning of her love affair with my hair. Any time she nursed, her hand would reach up, and grab hold. I’d joke that she was making sure her food supply didn’t wander off. If I carried her, her fingers would lock on. There was something primeval about it, clinging on gave my newborn a feeling of security in this confusing world. I didn’t mind. That changed. As the months passed, it became clear that she was very dependent on my hair. She needed to hold onto some to go to sleep, or while nursing. She was strong, and I got tired of having my hair pulled all the time. I knew nothing of sensory processing disorder at the time. All I knew is that she had a thing for my hair, and I didn’t like it. I’d put my hair up in a pony tail to keep out of her way, but then she started moving on to other people. Any woman with long hair was her target. Time after time I’d pull my toddler off unsuspecting strangers, hoping that one day her sense of boundaries would kick in. As she got bigger, other kids became her preferred victim of choice, as she could tower over them and touch their hair easily. Of course, if they tried the same, she would hate it. Only she was allowed to do the touching. I didn’t think that was particularly unusual at the time, but I tried to intervene, and give her dolls with hair to pull and twirl. Finally her own hair started to grow in. Just before she turned two, she finally had enough of her own hair to play with, and she would stretch the same piece out, and smooth it over with her other fingers in a bid to get to sleep. She touched my own hair much less often, and began to leave her friends alone too. Occasionally she would meet a stranger with long or interesting hair, and her old compulsion to touch it returned. Once she had done so, she was sated, but she needed to get her fix first. After we moved and her hair continued to grow in, she developed a habit of twirling a section around her fingers. She continues to do that to this day, and when she is particularly overwhelmed, she moves back to my hair, the original source of comfort. Cubby has developed a similar habit. Mercifully he never had the same interest in touching other people’s hair, but he adores mine, Daddy’s works in a pinch too. His sister will occasionally let him play with hers, but she has to be in the right mood for that. Several times a day his hands wind up around my tresses, and his tiny nails scratch my scalp. I feel like an ape being groomed. Just like Pudding, his hair has taken a long time to grow in. Only now does he have enough hair to be content to play with to go to sleep, though he still prefers mine. I’ve tried to cut his hair so he still has enough left to pull. Admittedly, it looks a little strange. This hair-pulling or twirling is one example of a “stim”, or self-stimulatory behaviour. Hair-twirling is a very common habit, especially for young girls, but like hand-flapping, humming, running around in circles, or bouncing up and down, its purpose is to provide appropriate sensory input to calm and regulate, and ultimately cope in a disordered world. One of Pudding’s therapists mentioned to me that she didn’t like Pudding’s hair stim, to which I responded that she didn’t have to. She has the ability to twirl her hair and do other things at the same time, so I see no reason to stop her at this point. This particular stim is about as typical as Pudding can be. Removing it would likely cause a replacement stim to begin that might be much more socially unacceptable, and potentially harmful. Instead I advised the therapist to instead reward the use of two hands for an activity if necessary. I can think of no better way to encourage her to pull out her hair until the point of baldness, than to make her stop touching it. Though well-intentioned, preventing a stim can be harmful. My girl needs all the coping methods she can find, and a replacement may be more stigmatizing, or even harmful. Hair twirling we can live with, though I may need to order a wig just in case she ever wants to move on to other people again. Pudding chatters all day long. There are certain times, like going to the library, or when I’m putting her brother to bed, or in the early hours of the morning, when I wish she was quiet. I instantly regret such a thought, of course, because speech is such a gift and we’re incredibly lucky to have an abundance, rather than an absence of her language. Like, oh, just about everything about Pudding, her language is atypical. This was the first thing I noticed in the symptoms that eventually led to her diagnosis. I noticed that while she spoke in long sentences, she couldn’t make conversation. And I noticed that she repeated. A lot. No, even more than that. She had echolalia. She still does, in fact, but it is slightly different in some ways. Echolalia is the repetition of another person’s speech. It can be immediate and delayed. All children go through a phase of echolalia, but verbal children with ASDs go through this period for much longer than children who are typically developing. “Uh-oh, what happened?” Once upon a time, someone (probably me) uttered those words upon seeing a mess, and Pudding’s brain recorded it for future use. Now any time there is a similar situation, this exact phrase is her way of calling attention to it. Her language is not yet flexible enough to tell me what happened spontaneously. Instead, we do a little dance where she asks the question, I repeat it back to her, and then she answers. If I’m patient and attentive, I coach her through the correct way of getting my attention and giving me the information. But because I know, I know, that when she utters that phrase it is because she has done something she knows she shouldn’t, and in my anger, my coaching slips away. She has slightly modified this to, “What happened to me?” in order to relate that she has fallen down and hurt herself. This seems to be the way she learns language; using the memorized phrase, then adapts it to her situation. Doing this is called functional echolalia. For a long time it formed the bulk of Pudding’s communication, and for an inflexible form of language, it works surprisingly well. I learned what she was trying to convey, and if her language abilities had ended there, I’d still be grateful that we could have a back-and-forth exchange. As she is so familiar with the question-answer format, this is her main way of gaining attention. It is predictable, and when your pragmatic skills are limited, predictable is safe. So if Pudding comes up to you and says: “What shape is that?”, she does not want you to tell her. She knew what a hexagon was before she was two, but this is the only way she knows to interact with you, and interaction is what she desperately seeks. It is one of the things that makes us most hopeful about her future- she wants to be part of our world, as difficult as that might be. Last year she had less spontaneous language use. If I asked her if she wanted an apple or an orange, she’d frequently respond with immediate echolalia: “Want a apple or orange“. Other times she’d just repeat the last choice, then get mad if I offered her the orange instead of the apple. Now she is able to make the correct choice, and even say “yes” which was a long time coming, though strangely enough, “no” was right on track. More and more spontaneous language is emerging, but she still uses a lot of echolalia. When she puts her own words together, it is like a tiny glimpse into the future. Sometimes I get tricked, the way she recently used, “shall we leave?” to indicate she wanted to leave the mall, was also used to exit the park. I’ve never heard her use “shall” in any other way, but she will, of course, as she assimilates the word into her vocabulary. She still uses some delayed and non-functional echolalia, I think just because she likes the way the words sounds together, almost like a stim. For instance, she likes to repeat the phrase “To the zoo“, but she seems to just like hearing it, she doesn’t have any communicative intent. There are dozens of examples like this, but I don’t really see a correlation between anxiety and her use of them as has been suggested in some texts. She just likes it, it feels good to her, so she continues to do it. Spectrummy Daddy and his friends do this with lines from movies too, so it might be something that is here to stay. It might even perform a social bonding function, assuming others share the same interests. Many children with delayed echolalia quote lines from TV or movies, but Pudding sticks to other people’s words, and books. She has entire books memorized, and she could deceive you into thinking she was reading the whole thing, she is fluent, and matches the picture up to the words. In reality she can read a few words, but nothing like the amount she has stored in her tape recorder brain. It is truly a marvel. I’m addicted to everything that comes out of her mouth, created or repeated; except, of course: “Uh-oh, what happened?”, that I could go without hearing for a few days!